Some may have been fans of the original back when it was released in April 2006 but we were not. Although the cover system mechanic came a few months earlier than Gears of War's, there was nothing really memorable about Rogue Trooper back then. 11 years later, the remastered version of Rebellion's title may have enhanced visuals over the original, but it feels so dated in every possible department it makes it impossible to recommend. 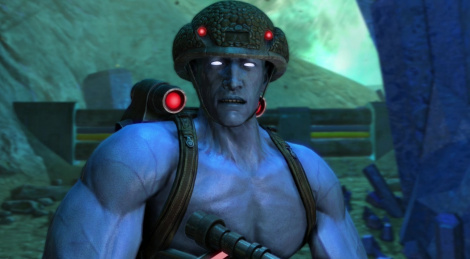 Some people like to play old game for the nostalgic feel they give, but we really can't picture anyone having fun playing Rogue Trooper today, even among those who enjoyed the original release. Don't get us wrong, we understand why some older games get remastered, and we usually have a great time going back in time for a while. In today's case though, just leave the Delorean in the garage and let Doc finish his well-earned nap. There are probably more exciting adventures ahead, or even behind, so just skip the journey back to 2006, unless it is to revisit Gears of War in the Ultimate Edition maybe. - The game wasn't really memorable in 2006, so can you imagine now? whats the point of reviewing game second time that u dont like in 2006? cus its just a remaster, not a remake. We didn't review the game back in 2006. The point is to let people know what it's worth today. It was average at best back then, today there really is no point in playing it. Considering what the Steam page of the game says about the so-called critical praise of the original, we natively thought it was our duty to let you know that there isn't much to praise today, and to remind it was not a hit in 2006 either. The point is to let people know what it's worth today. this was great when it first came out! one of rebellions most polished and fun titles before the sniper elite series went into full swing. sitting at a respectable 71 on metacritic! but even with a new lick of paint i can't imagine this has aged well at all. it was a game of it's time, it should have stayed there. Well no. I let people know that we weren't especially convinced back then, though some people were. Everyone has the right to change their opinion. Plus, why wouldn't we try to objectively see if there was anything that could appeal to the people who did enjoy the game at the time? Drift, you are so wrong about Rogue Trooper that it hurts. But opinions... so whatever. 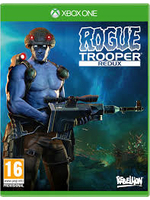 As a huge fan of the original Rogue Trooper, some of the reasons so many people like it are: the gameplay is very fun; the characters are caricatures that while highly stereotypical, have a lot of charm because it was intentional; the game is very funny with a great sense of humor; the upgrades were very cool and creative; great world building; enemies were funny and great to shoot at; the game kept constantly throwing new things at you at a very good pace; and so much more. I have no doubt that the gameplay feels dated if the remaster didn't touch it or only tweaked it a little, but it's best to leave these things alone since if one change it too much, it becomes like Crash remaster where the controls are different from the original, and worse. Since you mentioned it, I haven't played Gears of War Ultimate Edition yet, but I did play Gears of War 1 back when it released and it was a drag to be honest, all hype and no substance. Gears of War 2 was even worse, very terrible game. But I can tell you I had 100 times more fun playing Rogue Trooper on PS2 than playing both Gears of War 1 and 2 on X360. Though I had more fun with Gears of War 3 than with Rogue Trooper, even though that now that I think about it, both games share many characteristics. Rogue Trooper was never a perfect game, but it is a game which know what it is and what it aims to do, and it delivers in spades. It's a game with a lot of soul and most likely was made by a very passionate team who as far as I can tell, knew the source material - comics - very well. Just my opinion... so whatever. I can understand why some people would find it fun at the time, though to me, it wasn't. But today, it's just one of the most boring games I've played in years. I have not found any soul in it, it's tacky, voice acting is poor, gameplay is uninteresting, AI is laughable, etc. I was not expecting much considering it's just a remake, but when you decide to re-release a game, you must have a good reason to do so (either gameplay hasn't aged or it's been revamped to make it appealing to today's audience, and that includes AI). Some things are just better left in the past. I had so much fun playing the old Tomb Raider games back in the days, but I wouldn't want to play them now, unless they were remade like TR Anniversary (still good btw) or the recent promising TR2 remake. Then again, like you said, it's just my opinion. Rebellion need to make another Judge Dredd game, only have it more like GTA. Strange Brigade, their next game, seems pretty fun after playing it at Gamescom. yes, yes they do. they seem to just sleep on the license tbh which is a shame, doesn't have to even be dredd, could be slaine, finn, sinster/dexter, joe pinapple, strotium dog etc...so many cool licences they could make games using... but i guess they've found some great success with sniper elite so i can't blame them for sticking with whats popular. dredd needs to go more mainstream again i think for them to even consider it though. maybe not to the point of a bad sylvester stalone movie, but something that makes it a more known brand. i'm hoping the upcoming dredd TV series will do it. but after the karl urban dredd movie and how poorly it performed at box office (despite being awesome) i think the franchise is destined to remain a moderately popular comic series and nothing more. isn't that just their usual co-op side project they usually do using sniper elite assets and animations. like the nazi zombie army games? u mean openworld? i think rebellion cant do that. but... maybe the make Judge Dredd Redux soon? I'll buy this game in time but i must read some comics before. It's a 2000 AD Character(like Dredd) so the satire has to be there. And yes MrWhite, an other Rebellion Dredd game would be welcome as Dredd vs Death is something good. I'd take a new AVP with that but only if they come back to the roots (like AVP Jaguar and AVP 2000). "- The game was really memorable in 2006, so can you imagine now?" Was it meant to say "really unmemorable"? Or I don't understand it.